Boeing 707-138 VH-EBA carrying its US test registration N31239. 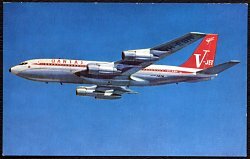 Boeing 707-138B VH-EBA after conversion to turbofan engines and adoption of the V-Jet livery. 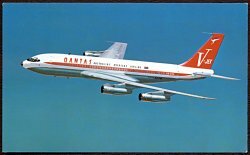 Boeing 707-138B VH-EBH was the first aircraft delivered to Qantas with turbofan engines and the first to carry the V-Jet livery. 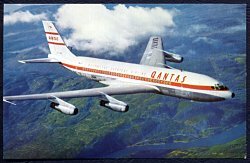 Boeing 707-338C VH-EBN was the first of the longer 320C version delivered to Qantas. 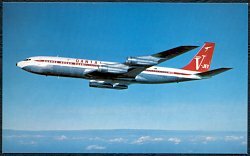 The previous postcard of Boeing 707-338C VH-EBN was reissued with the company name retouched to reflect a revised logotype. Boeing 707-338C VH-EBU was the first 707 to be painted in the ochre colour scheme. 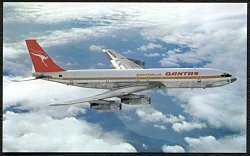 To commemorate the 40th anniversary of Qantas in 1960, the manufacturers of Lifebuoy soap produced a series of 10 cards featuring paintings of Qantas aircraft. The cards measured approximately 7.5cm by 4.5cm. 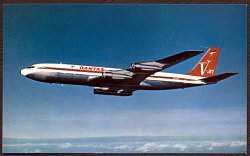 The Boeing 707 card is depicted. Others in the series were: Avro 504K, DH-9C, DH-50, DH-50J, DH-86, Short Empire, Avro Lancastrian, Super Constellation and L-188 Electra. "Sixty Million Miles Across the Pacific". 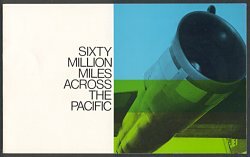 This folder was produced by Qantas to commemorate the 10th anniversary of the first commercial jet service across the Pacific on 29 July 1959. "Welcome Aboard Your Qantas Jetliner". This booklet was printed by Qantas in July 1959 for distribution to passengers on the new Boeing 707. The introduction begins: "We are delighted to have you aboard the new Qantas 707 Jetliner. This may be your first flight in a pure jet aeroplane." 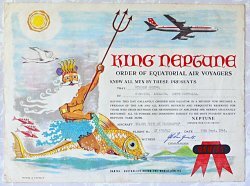 A certificate presented to five year-old Stephen Swayne to commemorate his crossing of the equator on VH-EBN on 15 September 1965. Stephen's father was serving in the Army at the time and QF178/042 was bringing the family home from a posting in Malaysia. This cardboard sliderule was issued to Qantas Cargo customers to enable them to determine if an item of freight would fit in a 707. 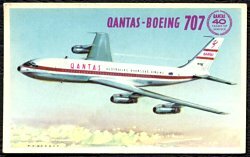 This sticker was issued circa 1959 to coincide with the introduction of the first Qantas 707s. 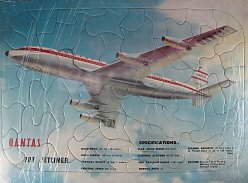 This jigsaw puzzle featured Qantas Boeing 707 VH-EBA. 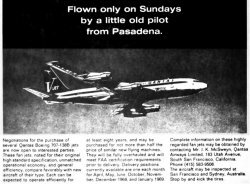 This 1968 press advertisement announced the sale of several 707-138Bs. 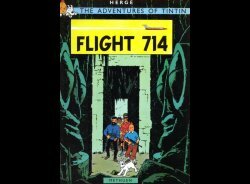 VH-EBA starred in this 1968 Tintin comic book. Additional items of memorabilia are always welcome. Please contact the Webmaster.